Stem cell-derived retinal pigment epithelium (RPE) cells may be used for multiple applications including cell-based therapies for retinal degeneration, disease modeling, and drug studies. Here we present a simple protocol for reproducibly deriving RPE from stem cells. Westenskow, P., Sedillo, Z., Barnett, A., Friedlander, M. Efficient Derivation of Retinal Pigment Epithelium Cells from Stem Cells. J. Vis. Exp. (97), e52214, doi:10.3791/52214 (2015). No cure has been discovered for age-related macular degeneration (AMD), the leading cause of vision loss in people over the age of 55. AMD is complex multifactorial disease with an unknown etiology, although it is largely thought to occur due to death or dysfunction of the retinal pigment epithelium (RPE), a monolayer of cells that underlies the retina and provides critical support for photoreceptors. RPE cell replacement strategies may hold great promise for providing therapeutic relief for a large subset of AMD patients, and RPE cells that strongly resemble primary human cells (hRPE) have been generated in multiple independent labs, including our own. In addition, the uses for iPS-RPE are not limited to cell-based therapies, but also have been used to model RPE diseases. These types of studies may not only elucidate the molecular bases of the diseases, but also serve as invaluable tools for developing and testing novel drugs. We present here an optimized protocol for directed differentiation of RPE from stem cells. Adding nicotinamide and either Activin A or IDE-1, a small molecule that mimics its effects, at specific time points, greatly enhances the yield of RPE cells. Using this technique we can derive large numbers of low passage RPE in as early as three months. The various cell types that occupy the retina are organized in a functional architecture. The photoreceptors in the back of the retina are responsible for converting light into electrical impulses through phototransduction. However, phototransduction cannot occur without the coordinated efforts of other neighboring cell types including Mueller glia and retinal pigment epithelium (RPE) cells. A monolayer of RPE cells partitions the sensory retina from the choriocapillaris, the primary blood supply for photoreceptors, and are ideally situated to control multiple functions important for photoreceptor homeostasis. In fact, the RPE and photoreceptors are so co-dependent they are widely considered to be one single functional unit. (For a review of all the diverse functions of the RPE see Strauss, 20051.) Death or dysfunction of retinal pigment epithelium cells can induce age-related macular degeneration (AMD), the leading cause of permanent vision loss in industrialized countries2-4. AMD is a multifactorial disease of RPE, photoreceptors, and the choroidal vasculature; risk factors are diverse and include combinations of environmental and genetic influences5,6. Treatments for AMD are very limited, but one promising potential therapy is RPE cell replacement7,8. While the outcomes have been mixed, the transplantation of RPE cells in AMD patients (and in other patients with retinal degeneration) and also in rodent models of retinal degeneration, has the potential to transiently prevent significant photoreceptor atrophy9-23. (The animal model commonly used for these studies are Royal College of Surgeons (RCS) rats, which harbor a mutation in the MerTK gene. This mutation renders RPE cells incapable of phagocytosing photoreceptor outer segments and promotes retinal degeneration24.) While the reported survival rates of implanted RPE in the subretinal space of RCS rats and mice vary greatly, there is potential for them to survive for several months or years9,10,12,20. RPE cells can be obtained in sufficient numbers for transplantation by deriving them from pluripotent stem cells9-14,25-28. Several independent groups have demonstrated that these cells function in similar ways to their somatic counterparts, and long term studies suggest that they are safe upon implantation in rat and mouse disease models9,10,12,14,19,20,25,29-32. The use of induced pluripotent stem cells instead of embryonic stem cells may be advantageous since ethical issues and immunological challenges associated with allogeneic RPE may be obviated33,34. Another exciting application for iPS technology is disease modeling35. The ability to interrogate large numbers of RPE cells derived from patients with RPE diseases could be invaluable for understanding their molecular bases. This type of study has been performed recently with Best disease patient RPE and could pave the way for similar studies of inherited maculopathies36. The derivation of RPE from stem cells is a relatively simple process and can be done entirely in xeno-free conditions. The simplest strategy is to derive monolayers of RPE cells spontaneously, however, the yield can be significantly improved using directed differentiation techniques. But these techniques involve the use of exogenous protein factors that can be expensive and often generated in bacteria or other non-human sources10,12,37. In our studies we followed an established protocol10 that utilizes nicotinamide and Activin A, a signaling factor that has been shown to be sufficient for RPE specification38. Here we will demonstrate that the small molecule IDE-1 can adequately replace Activin A, thus reducing costs and alleviating concerns associated with the use of recombinant proteins39. Additionally, we utilize xeno-free serum replacement, and we culture the differentiating RPE cells on a synthetic xeno-free substrate. RPE cells have been shown previously to differentiate very effectively using this approach40. When differentiated as a monolayer, we visualize pigmented colonies containing RPE cells after as early as five weeks12. Once they reach sufficient size, they can be manually excised and transferred to another dish for expansion. RPE cells are notorious for dedifferentiating with each passage, and the use of anything older than five passages should be avoided (we find that sufficient numbers of cells for characterization and transplantation in animal models can easily be generated after two or three passages). Once fully differentiated, we employ multiple techniques to characterize the cells anatomically and functionally to ensure that they will serve as adequate replacements for diseased RPE. The description of these techniques, and protocol for implanting the iPS-RPE in the subretinal space of rodents, are beyond the scope of this methods paper and have been previously published12,32,41. While developing standardized protocols for effective derivation of iPS-RPE is clearly important for the clinics, there is also significant preclinical work to still be done in animal models. There are concerns regarding immunogenicity of iPS-derived cells, and multiple different implantation techniques, including implanting cells on artificial substrates, are being explored42,43. For these reasons, we feel that the publication of standardized protocols is beneficial to facilitate both clinical and preclinical studies. Especially if direct comparisons will be done of iPS-RPE cells derived in different labs by different research groups. Maintain the hES or hiPS lines (feed daily) in maintenance media (MM; Table 1). Once the lines have reached sufficient standards of quality control, maintain them on a layer of mouse embryonic feeder cells (MEFs) seeded at a density of 250,000/well of a six well plate. Xeno-free cultures can also be generated following the protocol established by Tucker et al.40. Allow the stem cell colonies to reach confluency. Switch to differentiation media with Nicotinamide (DM/NIC; Table 1); feed daily. After three weeks in culture, switch to differentiation media with nicotinamide and either Activin-A or IDE-1 (DM/NIC/AA or DM/NIC/IDE1; Table 1) to enhance RPE differentiation. After five weeks in culture, switch back to DM/NIC. Daily feedings are no longer necessary once the pH indicators in the media stop turning yellow the day after feeding. Wait for islets of pigmented cells to appear that are large enough to be cut and removed (See Figures 2D-F and 3A). Coat the wells of a 24-well plate with a matrix that mimics the natural cell environment (xeno-free is preferable). NOTE: Cornea blades and sharp, fine-tipped forceps are very useful for picking. The entire sheet of differentiated cells can detach while picking. Avoid this by working carefully and initially picking colonies in the center of the dish. Fill as many wells of the 24-well plate with differentiation media (DM; Table 1) as needed. This decision will depend on the number of pigmented colonies collected. In a cell culture hood with a dissecting scope, manually cut out pigmented islets. Chop up each islet at the bottom of the original plate using a scalpel in about 2-6 pieces and grab the pigmented parts with sharp forceps. Transfer 1-2 pigmented pieces into each 24-well. Do not change media for 3-5 days until cells adhere, then start changing media three times per week. (If they do not adhere after this time, the likelihood is good that they never will). Expand cells for 3-4 weeks in differentiation media (DM; Table 1) -- An image of a typical culture is shown in Figure 3B. Cells may still not fill the entire well but waiting longer does not seem to help. Feed cells three times per week. After about 3 weeks, manually remove clusters of white cells in clumps if necessary with sharp forceps. Do not do this step unless it is necessary – it is easy to introduce contaminants. It is ideal to try to obtain purest populations of RPE from the original pigmented colonies in step 1.6. Detach cells with 200 µl with a cell dissociation solution (preferably not trypsin—a reagent that can be inactivated through dilution is preferable) for 5-8 min at 37 °C, and inactivate it by diluting with DM. Use a 200 µl pipette to wash off all cells and to resuspend them (If the selected well contains only a few cells, consider pooling the cells from two 24-wells). Centrifuge (800 x g for 5 min), discard supernatant, and resuspend in 3 ml DM media. Re-plate cells from one (or two) 24-wells into one matrix coated 6-well in 3 ml of DM per well (1:5 expansion). Expand for 1-2 weeks until the cells are ~90% confluent; an image of fully differentiated pure culture is shown in Figure 3C. Detach cells with 1 ml cell dissociation solution for about 5-8 min at 37 °C, inactivate it by dilution with DM, use 1,000 µl pipette to wash off all cells, and resuspend them. Spin down (800 x g for 5 min), discard supernatant, and resuspend in 18 ml DM media. Re-plate cells from one 6-well each into six matrix coated 6-wells in 3 ml of DM per well (1:6 expansion) or one-coated 75cm2 flask (1:7.5 expansion). Repeat steps 3.4–3.8 as necessary until enough cells are obtained. NOTE: Try to collect as many colonies as possible for expansion rather than planning to amplify the cultures via passaging since each passage induces RPE dedifferentiation. The steps outlined in this manuscript, as depicted in Figure 1, can be used to readily generate RPE from stem cells as previously reported10,12. After maintaining the iPS lines for several weeks, pigmented colonies begin to appear in the colonies after 5-7 weeks (7 week old cultures are shown in Figure 2A-C). These colonies can continue to grow for weeks as the cultures are maintained. Once reaching sufficient sizes, as shown in Figure 2D-F (8 week old cultures), they can be manually excised as illustrated in Figure 3A. Careful excision to avoid contamination with non-RPE cells will greatly facilitate the generation of sufficiently pure RPE cultures (Figure 3B-C). Figure 1: Schematic depicting iPS-RPE derivation. Naive stem cells are cultured in maintenance media until reaching confluency. 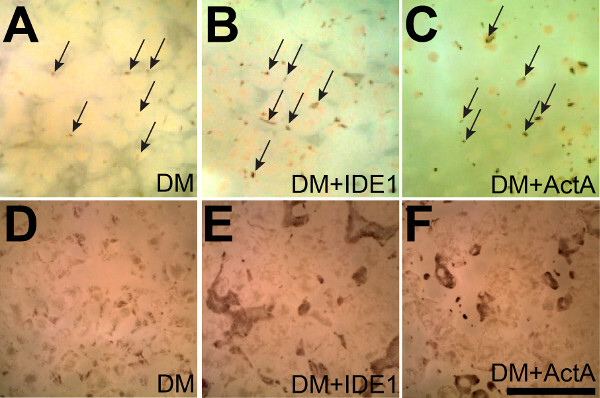 At day 0 differentiation media (DM) lacking bFGF but containing nicotinamide is added (DM/NIC). The cells are fed daily with this media for three weeks. At the end of week three the DM media is supplemented with either recombinant Activin A (DM/NIC/AA) or IDE-1 (DM/NIC/IDE1) to enhance RPE specification and the cells are fed with this media for two weeks. During this treatment pigmented colonies begin to appear, these enlarge over the next few weeks and by week 8 can be manually removed and transferred to new plates for expansion in DM. (See Table 1 for specific media components) Please click here to view a larger version of this figure. In this manuscript we outline the steps to efficiently generate large numbers of pure iPS-RPE cultures. We have shown previously using this directed differentiation protocol with Activin A that we can generate iPS-RPE that strongly resemble hRPE based on transcriptomics, proteomics, metabolomics, and functionality, and that they retard retinal degeneration when implanted in RCS rats12,31,32. The process of generating iPS-RPE is time-consuming, but not laborious (Figure 1). Once the iPS cultures reach confluency they must be fed with differentiation media on a daily basis. We supplement the media with either Activin A or a less expensive small molecule IDE-1, and continue feeding for two weeks while monitoring the cultures for pigmented iPS-RPE colonies that generally appear after 5-7 weeks (Figure 2A-C). Once reaching sufficient sizes (Figures 2D-F and 3A), the colonies are manually removed and transferred to new plates for expansion. This occurs roughly after 8 weeks and is the most laborious step of the entire protocol. The most challenging aspect is avoiding contamination with non-RPE cells in the expanding cultures by accidentally collecting unwanted neighboring cells in or around the pigmented colonies. Depending on the degree of contamination, islands of non-RPE cells can be removed manually during expansion, although each time the cultures are handled additional risks of introducing bacterial or fungal contaminants are increased. It is worth noting that in our experience the iPS-RPE can actually “outcompete” a small number of contaminating cells during the passaging steps. But we strongly recommend taking great caution when picking colonies to ensure they are as pure as possible to avoid having to resort to these steps. By the second or third passage the iPS-RPE cultures are sufficiently pure and sufficient numbers of cells are available for characterization and implantation. The technique reported here is certainly not the only method for deriving stem cell derived RPE. In fact it is neither the easiest nor the fastest. The easiest and most widely method is to use spontaneous differentiation. (However, supplementation with IDE-1 for two weeks is inexpensive and greatly increases the yield of iPS-RPE.) iPS-RPE have also generated in embryoid bodies that differentiate into spheres of polarized RPE cells that can be forced to adhere to surface of culture plates and expand as a monolayer. RPE cells generate using this method have also been very vigorously characterized and strongly resemble hRPE27. RPE can differentiate extremely rapidly (in only 14 days) from stem cells by supplementing the media with nicotinamide, IGF1, Noggin, Dkk1, and bFGF to convert them to neural retinal progenitor fates, then later adding the pro-RPE factors nicotinamide and Activin A37. RPE can also be generated even more rapidly directly from fibroblasts in roughly one month by transducing the fibroblasts with a minimal set of transcription factors including cMYC, MITF, OTX2, RAX, and CRX44. However, while these results are very encouraging the RPE generated these last two techniques have not yet been rigorously characterized by implanting them in vivo. Therefore, we suggest that the reader consider all RPE derivation options carefully when deciding which to employ in their studies. The advantages of using the protocol outlined here are its simplicity and consistently high yields of very high-quality RPE31. Supplementation with IDE-1 rather than Activin A greatly reduces the overall cost and lowers the risk involved with using recombinant proteins. Since it is not yet clear if the choice to use different differentiation methods will have an impact on the final product, it could be advantageous to utilize standardized protocols, especially if direct comparisons between RPE generated in different labs will be necessary (perhaps particularly in the case of disease modeling). A simple protocol like this one that requires little expertise and reagents, and that generates high yield of iPS-RPE, might be ideal for these situations. None of the authors have any commercial disclosures to declare. We wish to thank the following individuals: Drs. Tim Krohne and Eyal Banin (along with Dr. Mandy Lehmann and David Friedlander) for generous help developing the differentiation protocols. Dr. Felicitas Bucher provided assistance differentiating the RPE cells used in this study. We also acknowledge the National Eye Institute (NEI grants EY11254 and EY021416), California Institute for Regenerative Medicine (CIRM grant TR1-01219), and the Lowy Medical Research Institute (LMRI) for very generous funding for this project. Strauss, O. The retinal pigment epithelium in visual function. Physiol Rev. 85, (3), 845-881 (2005). Congdon, N. Causes and prevalence of visual impairment among adults in the United States. Arch Ophthalmol. 122, (4), 477-485 (2004). Friedman, D. S. Prevalence of age-related macular degeneration in the United States. Arch Ophthalmol. 122, (4), 564-572 (2004). Resnikoff, S. Global data on visual impairment in the year. Bull World Health Organ. 82, (11), 844-851 (2002). Bird, A. C. Therapeutic targets in age-related macular disease. The Journal of Clinical Investigation. 120, (9), 3033-3041 (2010). Jong, P. T. Age-related macular degeneration. N Engl J Med. 355, (14), 1474-1485 (2006). Binder, S., Stanzel, B. V., Krebs, I., Glittenberg, C. Progress In Retinal And Eye Research. Transplantation of the RPE in AMD. 26, (5), 516-554 (2007). Cruz, L., Chen, F. K., Ahmado, A., Greenwood, J., Coffey, P. RPE transplantation and its role in retinal disease. Progress In Retinal And Eye Research. 26, (6), 598-635 (2007). Carr, A. J. Protective effects of human iPS-derived retinal pigment epithelium cell transplantation in the retinal dystrophic rat. PLoS One. 4, (12), e8152 (2009). Idelson, M. Directed differentiation of human embryonic stem cells into functional retinal pigment epithelium cells. Cell Stem Cell. 5, (4), 396-408 (2009). Klimanskaya, I. Derivation and comparative assessment of retinal pigment epithelium from human embryonic stem cells using transcriptomics. Cloning Stem Cells. 6, (3), 217-245 (2004). Krohne, T. Generation of retinal pigment epithelial cells from small molecules and OCT4-reprogrammed human induced pluripotent stem cells. Stem Cells Translational Medicine. 1, (2), 96-109 (2012). Lund, R. D. Human embryonic stem cell-derived cells rescue visual function in dystrophic RCS rats. Cloning Stem Cells. 8, 189-199 (2006). Vugler, A. Elucidating the phenomenon of HESC-derived RPE: anatomy of cell genesis, expansion and retinal transplantation. Exp Neurol. 214, (2), 347-361 (2008). Algvere, P. V., Berglin, L., Gouras, P., Sheng, Y. Transplantation of fetal retinal pigment epithelium in age-related macular degeneration with subfoveal neovascularization. Graefes Arch Clin Exp Ophthalmol. 232, (12 ), 707-716 (1994). Binder, S. Outcome of transplantation of autologous retinal pigment epithelium in age-related macular degeneration: a prospective trial. Invest Ophthalmol Vis Sci. 45, (11), 4151-4160 (2004). Binder, S. Transplantation of autologous retinal pigment epithelium in eyes with foveal neovascularization resulting from age-related macular degeneration: a pilot study. Am J Ophthalmol. 133, (2), 215-225 (2002). Falkner-Radler, C. I. Human retinal pigment epithelium (RPE) transplantation: outcome after autologous RPE-choroid sheet and RPE cell-suspension in a randomised clinical study. British Journal of Ophthalmology. 95, (3), 370-375 (2011). Li, Y. Long-term safety and efficacy of human-induced pluripotent stem cell (iPS) grafts in a preclinical model of retinitis pigmentosa. Molecular Medicine (Cambridge, Mass). 18, 1312-1319 (2012). Lu, B. Long-Term Safety and Function of RPE from Human Embryonic Stem Cells in Preclinical Models of Macular Degeneration). Stem Cells. 27, (9), 2126-2135 (2009). Peyman, G. A. A technique for retinal pigment epithelium transplantation for age-related macular degeneration secondary to extensive subfoveal scarring. Ophthalmic Surgery. 22, (2), 102-108 (1991). Schwartz, S. D. Embryonic stem cell trials for macular degeneration: a preliminary report. The Lancet. 379, (9817), 713-720 (2012). Wang, N. K. Transplantation of reprogrammed embryonic stem cells improves visual function in a mouse model for retinitis pigmentosa. Transplantation. 89, (8), 911-919 (2010). Cruz, P. M. Mutation of the receptor tyrosine kinase gene Mertk in the retinal dystrophic RCS rat. Human Molecular Genetics. 9, (4), 645-651 (2000). Buchholz, D. E. Derivation of functional retinal pigmented epithelium from induced pluripotent stem cells. Stem Cells. 27, (10), 2427-2434 (2009). Hirami, Y. Generation of retinal cells from mouse and human induced pluripotent stem cells. Neurosci Lett. 458, (3), 126-131 (2009). Meyer, J. S. Modeling early retinal development with human embryonic and induced pluripotent stem cells. Proceedings of the National Academy of Sciences. 106, (39), 16698-16703 (2009). Osakada, F. In vitro differentiation of retinal cells from human pluripotent stem cells by small-molecule induction. J Cell Sci. 122, (17), 3169-3179 (2009). Carr, A. J. Molecular characterization and functional analysis of phagocytosis by human embryonic stem cell-derived RPE cells using a novel human retinal assay. Mol Vis. 15, 283-295 (2009). Kokkinaki, M., Sahibzada, N., Golestaneh, N. Human Induced Pluripotent Stem-Derived Retinal Pigment Epithelium (RPE) Cells Exhibit Ion Transport, Membrane Potential, Polarized Vascular Endothelial Growth Factor Secretion, and Gene Expression Pattern Similar to Native RPE. Stem Cells. 29, (5), 825-835 (2011). Westenskow, P., Friedlander, M. Ch. 111. The New Visual Neurosciences. Werne, J. S., Chalupa, L. M. The MIT Press. Cambridge, MA. 1611-1626 (2013). Westenskow, P. D. Using flow cytometry to compare the dynamics of photoreceptor outer segment phagocytosis in iPS-derived RPE cells. Invest Ophthalmol Vis Sci. 53, (10), 6282-6290 (2012). Algvere, P. V., Gouras, P., Dafgard Kopp,, E, Long-term outcome of RPE allografts in non-immunosuppressed patients with AMD. Eur J Ophthalmol. 9, (3), 217-230 (1999). Zhang, X., Bok, D. Transplantation of retinal pigment epithelial cells and immune response in the subretinal space. Invest Ophthalmol Vis Sci. 39, (6), 1021-1027 (1998). Gamm, D. M., Phillips, M. J., Singh, R. Modeling retinal degenerative diseases with human iPS-derived cells: current status and future implications. Expert Review Of Ophthalmology. 8, 213-216 (2013). Singh, R. iPS cell modeling of Best disease: insights into the pathophysiology of an inherited macular degeneration. Hum Mol Genet. 22, (3), 593-607 (2013). Buchholz, D. E. Rapid and efficient directed differentiation of human pluripotent stem cells into retinal pigmented epithelium. Stem Cells Transl Med. 2, (5), 384-393 (2013). Fuhrmann, S., Levine, E. M., Reh, T. A. Extraocular mesenchyme patterns the optic vesicle during early eye development in the embryonic chick. Development (Cambridge, England). 127, (21), 4599-4609 (2000). Borowiak, M. Small molecules efficiently direct endodermal differentiation of mouse and human embryonic stem cells. Cell Stem Cell. 4, (4), 348-358 (2009). Tucker, B. A., Anfinson, K. R., Mullins, R. F., Stone, E. M., Young, M. J. Use of a synthetic xeno-free culture substrate for induced pluripotent stem cell induction and retinal differentiation. Stem Cells Transl Med. 2, (1), 16-24 (2013). Ramsden, C. M. Stem cells in retinal regeneration: past, present and future. Development (Cambridge, England). 140, (12), 2576-2585 (2013). Zhao, T., Zhang, Z. -N., Rong, Z., Xu, Y. Immunogenicity of induced pluripotent stem cells. Nature. 474, (7350), 212-215 (2011). Zhang, K. Direct conversion of human fibroblasts into retinal pigment epithelium-like cells by defined factors. Protei., & Cell. 5, (1), 48-58 (2013).